Friends of De Soto at the Depot! This event has sold out, thank you! Train ride, music and BBQ! Join us Sunday, November 4th, at 5:00 PM for a one-of-a-kind train excursion. 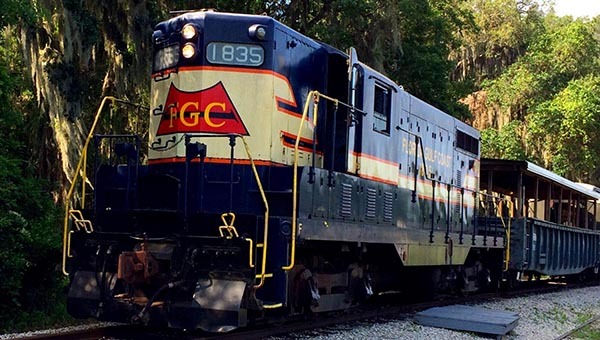 We will meet at the Florida Rail Museum in Parrish, where we’ll board a beautifully restored vintage train (which we are unofficially calling the De Soto Express) and take a leisurely scenic ride to historic Willow Florida. Upon arrival, we will have live music featuring blues musician Steve Arvey and his fabulous band. Award winning Chef Robert will prepare a fantastic BBQ dinner featuring pulled pork, collard greens, baked beans and more! After dinner we return by train to the Parrish depot. So make sure you have a ticket to ride and we’ll keep you on the right track! Tickets are just $38 for members and $45 for non-members. or call 1 (941) 704-6825 to make other arrangements. Turn right on to 83st E.
It will be the first right after you cross the RR tracks. Locomotive: Image by the Florida Rail Museum. Ticket sales end Nov 4th, all tickets are non refundable. All proceeds benefit the De Soto national memorial. Friends of De Soto is a 501(c)(3) non-profit organization with the mission of maintaining, restoring and promoting the De Soto national memorial located in Bradenton Florida.